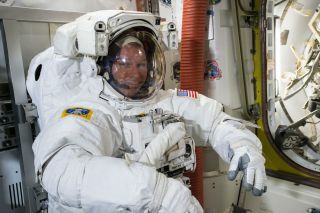 NASA astronaut Terry Virts tries on his spacesuit in preparation for a Feb. 21 spacewalk outside the International Space Station with crewmate Barry Wilmore. EDITORS NOTE, 2:26 p.m. EST (1926 GMT): The astronauts are safely back onboard the International Space Station and the spacewalk is officially over, with a total run time of 6 hours 41 minutes. Two NASA astronauts will perform a spacewalk outside the International Space Station today (Feb. 21) to begin outfitting the orbiting lab's docking ports to receive future private space taxis and people on Earth can watch the spacewalk live online. Astronauts Barry Wilmore and Terry Virts will venture outside the International Space Station today (Feb. 21). Barry Wilmore, commander of Expedition 42, and flight engineer Terry Virts are scheduled to exit the space station at about 7:10 a.m. EST (1210 GMT). You can watch the live broadcast on Space.com, beginning at 6 a.m. EST (1100 GMT). Today's spacewalk is the first of three for Wilmore and Virts to prepare the station for the installation of new docking stations, which will allow the station to link up with future space taxis ferrying new crews to the orbiting lab. NASA plans to use private spacecraft built by Boeing and SpaceX to fly American astronauts on trips to and from the station beginning in 2017. Each of the upcoming spacewalks are expected to take approximately 6-and-a-half hours. Today's excursion will mark Wilmore's second spacewalk and a career first for Virts. The pair will be assisted by European Space Agency astronaut Samantha Cristoforetti, who will work inside the space station. The American side of the International Space Station is currently undergoing a transformation, in preparation for the arrival of more commercial vehicles to the station. This year, NASA plans to attach two international docking adapters (IDAs) to the station, which can receive crewed commercial vehicles. They will attach to the pressured mating adapters (PMAs) on the station's Harmony module. This NASA graphic shows the eventual locations of two International Docking Adapters for commercial spacecraft on the International Space Station. Astronauts Barry Wilmore and Terry Virts will conduct a series of spacewalks to outfit the station for the docking adapters in February and March 2015. "We're doing a lot of reconfiguration this year," Kenneth Todd, station operations and integration manager said at a news conference on Feb. 18. "We are really trying to take the station into this next phase in support of the commercial industries and providers. […] It all kind of gets started here in the next couple of weeks with the EVAs." During today's spacewalk, the first activity for Wilmore and Virts will be to lay the cables that will provide power and data for the first of the new docking adapters. "This will be the most complicated cable routing task that we have performed by EVA on ISS to date," Karina Eversley, lead officer for today's spacewalk, said in the news conference. "There is an equally complicated set of cable routing that has to be done internal to the space station as well." Wilmore and Virts are scheduled to finish the spacewalk by setting up the Common Communications for Visiting Vehicles system, which will aid visiting vehicles as they rendezvous and dock with the station. Setting up the new communications system will involve laying more than 400 feet (122 meters) of cable. Wilmore and Virts will extend four 100-foot (30 m) legs of cable that will stretch from the center of the station out to four antennas. Wilmore, Virts and Cristoforetti will be joined by three cosmonauts: flight engineers Alexander Samokutyaev, Elena Serova and Anton Shkaplerov. Wilmore, Samokutyaev and Serova are scheduled to return to Earth in March. Virts, Shkaplerov and Cristoforetti are scheduled to return in May. Altogether, today's spacewalk and the two that will follow it represent the 185th, 186th and 187th spacewalks in support of space station assembly and maintenance, according to NASA. Construction of the station began in 1998. It has been crewed by rotating teams of astronauts and cosmonauts since 2000.